Shi Yi won the 'Journalist of the Year' at our 2016 China Environmental Press Awards for three pieces of outstanding reporting in 2015. This piece, which highlights the plight of the endangered Yangtze finless porpoise, was published by Thepaper.cn here in April 2015. The countdown to save an ancient species from extinction has started: the Yangtze finless porpoise can no longer survive in the Yangtze River. 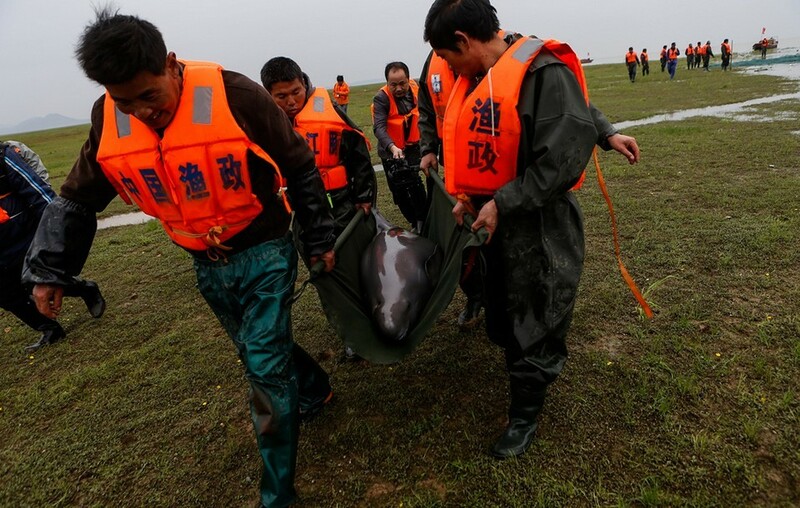 In late March 2015, eight of the porpoises were moved from Poyang Lake, which lies on the Yangtze, to Jingzhou, a city 500 kilometres away in Hubei province. Long ago, the river flowed through Jingzhou, but nowadays the river course is calm and quiet, unlike the turbulent Yangtze. Jingzhou is intended to be a refuge for the porpoises. This relocation is the last resort in efforts to conserve an endangered species. The programme, supported by China's Ministry of Agriculture, backs institutions and organisations investigating and protecting the Yangtze finless porpoise and the fishery authorities. A 2012 survey by the Chinese Academy of Sciences’ Institute of Hydrobiology found that the number of finless porpoise had shrunk to 1,040 in the wild – less than 60% of the remaining numbers of China’s giant panda population. Extinction within the next five to ten years seemed certain. The Yangtze is the world’s third longest river, and was once “China’s Amazon” – a place of great biodiversity. A native of the Yangtze, the finless porpoise is a symbol of the river and it’s fate reflected the river’s health. Water levels on Poyang Lake are still low in mid-March. Nineteen boats are lined up on the water – the fishermen have spotted a finless porpoise and the lead boat is using flag signals to direct the others towards it. The finless porpoise lives only in the Yangtze, occupying two lakes on the river, Dongting and Poyang. An aquatic mammal, the porpoise needs to breathe at the surface every few minutes. Once spotted, the fishermen use their sonar systems to herd the porpoises into the shallows. The scene reminds Gao Daobin of the baiji, one of the world’s four species of freshwater dolphins that used to dwell in the Yangtze. Before taking retirement, Gao was deputy director of the Tian’ezhou Yangtze Dolphin Nature Reserve. Founded in 1990, the reserve is the only place in China to have successfully found a new home for a finless porpoise. It was originally set up to save the baiji, but tragically it only saved one. In 2007 scientists declared the baiji functionally extinct. Wang Ding, a researcher at the Institute of Hydrobiology, also often refers to the baiji. In the summer of 2006 he was part of a multinational team that spent months searching a 3,000-kilometre stretch of the Yangtze, from Yichang to Shanghai, in vain. Wang made the announcement to the media personally – a sad task for a man who had spent two decades researching cetaceans. He recalls a US expert saying that the baiji was “no longer ‘made in China’”. It is very rare for two cetacean species to co-exist on one river – the only other instance is on the Amazon, where both the Amazon river dolphin and the tucuxi live. Now, the finless porpoise is the Yangtze’s sole aquatic mammal. Despite a lack of historical data, scientists commonly believe that baiji numbers started to plummet in the 1950s, when human activity on the river increased. By the end of the 1990s there were only 20 left, leaving no hope of saving the species. In the 1990s the Institute of Hydrobiology estimated there were 2,700 finless porpoises – in 2012 a survey found the population had dropped to 1,040. Faced with this, scientists and conservationists settled on a solution: to relocate the animals. Wang Ding’s research found that if no action was taken, then the current rate of population decrease would very likely mean extinction by 2025. This prompted an action plan on how to save the species. 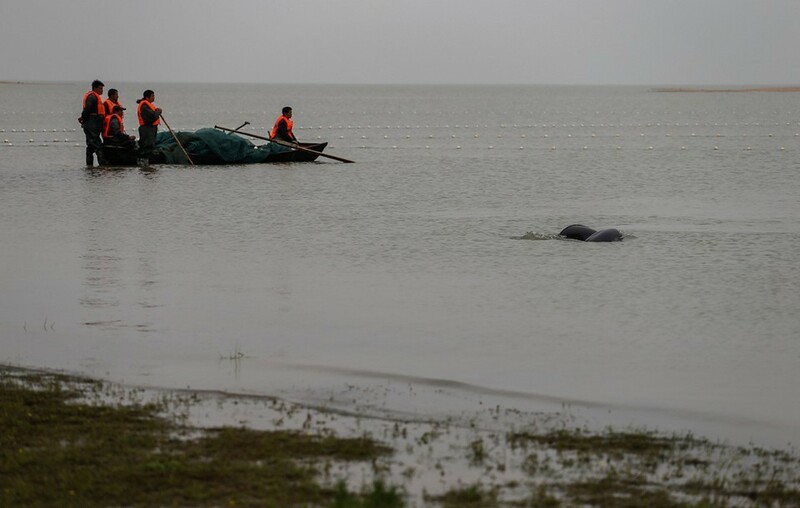 The Tian’ezhou Reserve in Shishou, Hebei, was the first to receive relocated porpoises. In 1990 scientists didn’t want to risk moving baiji, which were already very rare, without any experience. So they experimented with five finless porpoises. The migrants took to their new surroundings quickly, with the group of five expanding to 40. The latest survey by the reserve shows that three to six porpoises are born every year, with a total of 30 porpoises at the Tian’ezhou Reserve. This is now the only population of the finless porpoise that is growing. Tian’ezhou and Hewangmiao are both former courses of the Yangtze. Stand on the bank looking over the sunlit river and fields and you might think you were standing in a painting by Monet – this is a completely different world to the bustling Yangtze, which is why Wang Ding was drawn to the spot. Three years ago the World Wide Fund for Nature (WWF) offered to fund two relocation sites in the river at Hewangmiao. After lengthy monitoring of water quality and fisheries it was concluded that apart from fishing activity there were no sources of pollution and the river remained in its natural state. The river here is also connected to the Yangtze at certain times of year. If well-looked after, a population of 100 porpoises could survive here. But the Tian’ezhou Reserve alone is not enough. In 2008 southern China suffered freezing weather conditions that left a 30-centimetre sheet of ice over the river. The porpoises had to smash holes in the ice with their heads to breathe. Gao Daobin recalls finding six that had died from festering wounds as a result. Nobody had ever expected a river that far south to freeze, but as Gao points out, this shows the need for more reserves. Wang Ding agrees – as the population increases inbreeding and disease will become a greater problem, and the extreme weather events caused by climate change may have a negative, perhaps even fatal, impact on the porpoise population. The only option is to find more river stretches to establish reserves on. In 2012 the Ministry of Agriculture held a national meeting on the protection of dolphins and porpoises, at which both experts and fishery managers agreed there is little hope of near-term improvements to the Yangtze environment. After that meeting, the ministry commissioned the Institute of Hydrobiology to draw up a plan to save the finless porpoise. An important part of that plan was identifying suitable alternative habitats in the Yangtze basin for new reserves. Wang Ding explained that the current intent is to establish five to ten such reserves throughout the Yangtze basin over the coming decade. Individual animals will be moved between the locations in order to maintain genetic diversity. The plan got underway, with eight healthy young porpoises selected for relocation to Hewangmiao and Tian’ezhou in March this year. There are high hopes for these animals – four male, four female, and all between two and five years of age. 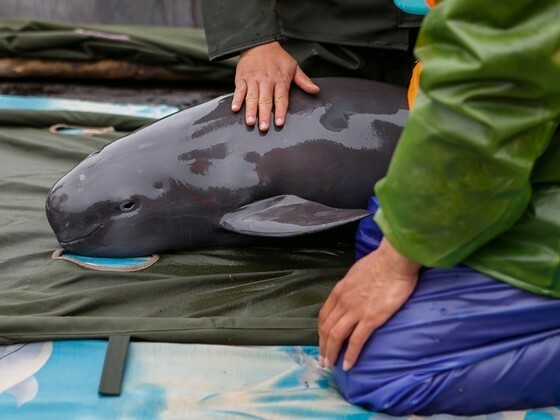 The finless porpoise is a native of the Yangtze, and ideally this is where it will stay, but conservationists have had to opt for a practical compromise. There are 300 species of fish living in the Yangtze, half of which are not found anywhere else. One-third of these species are under threat. In 2013 the WWF and the Yangtze Fishery Resources Commission issued a joint warning that fisheries on the upper reaches of the river were close to collapse and that half of species unique to the river had disappeared. Human activity – overdevelopment of hydropower and illegal fishing – were the cause. Also, long term monitoring by a number of research institutions has found that the annual number of newly hatched farmed fish have plummeted from 30 billion a year in the 1950s to less than 100 million today. Since 1990 eight reserves have been set up along the Yangtze and Dongting and Poyang lakes. These include national reserves at Tian’ezhou and Honghu Xinluo in Hubei and Tongling in Anhui province. There are also five local porpoise reserves at Dongting, Poyang, Anqing, Zhenjiang and Nanjing. Combined these protect one third of the middle and lower reaches of the Yangtze. But the 2012 survey found population numbers were dropping faster on the Yangtze proper than on its tributaries, by 13.7%. Li Yanliang of the Ministry of Agriculture’s Yangtze Fisheries Management Office says that unlike on land, it is not possible to isolate a river reserve. There are major projects underway on the river, with each managed by different government departments, and coordination and communication between these groups is a problem.